Tripura Public Service Commission, Is Looking For Eligible Candidates To The Post Of Sub Inspector Of Police, Which Is Mention Above. So Interested Are Requested To Apply For This Job Through Online Application Mode Within The Given Time. Sub Inspector (SI) →53 Vacancies, Kindly Do Go Through The Image's Below For Name Of Post, Vacancies Distribution, Educational Qualifications, Age Limit, Physical Measurements (Chest, Height, Weight). (Credit- The Official Advertisement Advt. No. 03/2019 TPSC). B. 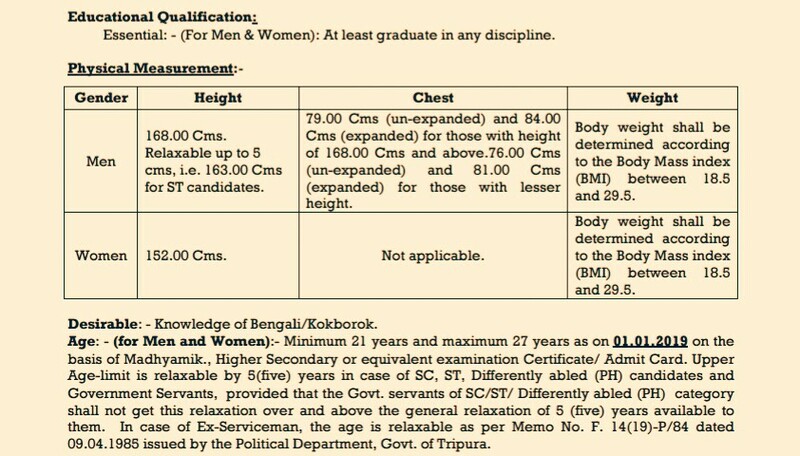 Eligible Criteria For SI VacanciesVacancies In Tripura PSU Recruitment 2019. Age Limit →Check Out The 2nd Image. Educational Qualifications →Graduate In Any Discipline. Mode Of Examination/Selection Process →Physical Efficiency Test/Written Exam/Personality Test. Online Application/Examination Fee →₹100 For Unreserved Candidates And ₹50 For Reserved Candidates, Through Online Mode. Now Apply For TPSC Recruitment 2019 For SI Post. Thank You For Your Continues Support And Love Towards Our Website, Till Then Stay Safe And Blessed.